It’s Friday, already? It is indeed, so the time has come for another Friday Five! For those of you who are checking out The Friday Five for the first time and are wondering what it’s all about, this is a feature that I post every Friday in which I give my thoughts on a topic that’s related to basketball video games, the real NBA or another area of interest to our community, either as a list of five items or in the form of a Top 5 countdown. It’s been a couple of months since I’ve done a Top 5 for The Friday Five, so this week I thought I’d give the lists a rest and compile a countdown instead. If you’ve been reading the Friday Fives for a while or have seen some of my other previous editorials, you’ll know that I’m big on game modes that offer an immersive experience and significant replay value. Today I’m taking a look back at some of the good times I’ve had in those modes, as I count down my Top 5 Basketball Game Experiences. 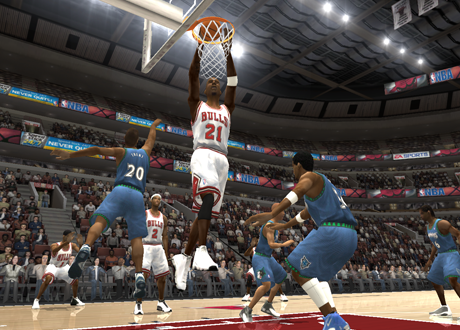 NBA Live 2000 saw the debut of Franchise Mode, the multi-season mode that would later be re-branded Dynasty. I was very eager to try it out and while the concept has come a long way since then, for its time it did not disappoint. From the time I picked up the game right through until the release of NBA Live 2001, I spent a lot of time playing and simulating Franchise games, trying out all sorts of trades, drafting generated rookies and finding out when all the real players tended to retire. Back then, I was in high school and my cousin, who is a fellow gamer and basketball fanatic, would come and stay with us for most of the school holidays. When we weren’t shooting around in the backyard, trying to emulate our favourite players, we’d usually split our time between playing Season Mode in NBA Live and messing around in NBA Jam or NBA Hangtime. One school holidays, we started an NBA Live 2000 Franchise game with the Portland Trail Blazers in which we put together a star studded team that included Shaquille O’Neal, Baron Davis and Rasheed Wallace. We played every contest in a 28 game regular season (12 minute quarters) followed by an abbreviated Playoffs bracket (1-1-1-1), finally culminating in an NBA Championship in the wee hours of one morning. As was our custom, we celebrated with some late night microwave popcorn. 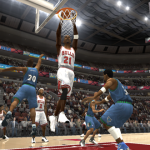 Although we had the Three Point Shootout in NBA Live 98, NBA Live 99 and NBA Live 2000, the full All-Star Weekend – well, all of the major events anyway – was a long time coming in NBA Live 2005. 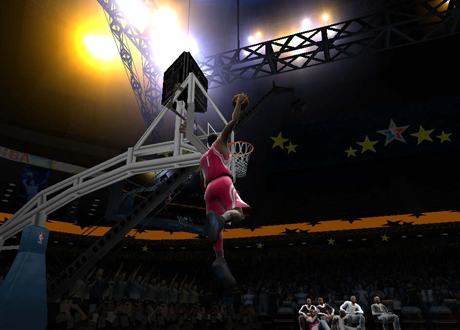 One of the most popular Wishlist items had finally been implemented: we had a fully fledged Dunk Contest in the game! The presentation was quite good for its time, with separate commentary by Ernie Johnson and Kenny Smith, judges holding up scorecards in the Dunk Contest, different jumpshot styles in the Three Point Shootout and so on. I have to admit, the sim gamer in me was initially a little disappointed that some of the dunks in the contest we so outlandish and that those were the ones that you had to pull off if you wanted to get a really good score. However, it made sense to keep the Dunk Contest interesting with a variety of crazier stuff and it didn’t detract from the realism of the five-on-five game, so I warmed up to the idea very quickly. There’s something very satisfying about pulling off a double between-the-legs dunk or an off-the-camera lob for a 360 on Superstar difficulty, to say nothing of the 540 and 720 dunks. Fun to play as a standalone mode, All-Star Weekend naturally added a little something extra to Dynasty Mode as well. It also came with a couple of extra mini-games in the form of the Freestyle Challenges, which were fun to play every now and again when you had five minutes to kill. Should All-Star Weekend find its way back into the NBA Live series sometime in the near future, it will be a most welcome return. This Dynasty easily ranks as one of my favourites and I really enjoyed maintaining a story thread for it. It’s also unusual for a couple of reasons: first, I was using the Chicago Bulls, who are my favourite team but at the time weren’t exactly an appealing option. 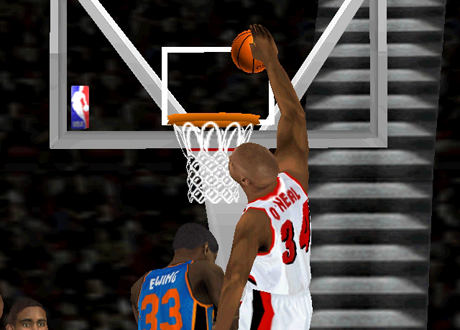 Second, I played it on the PlayStation 2, even though I prefer to play basketball games on the PC. In this case however, the PS2 version came out first and I was just too into the Dynasty to start a new one on PC. It was in this Dynasty that I managed to pull off one of my best trades: Jalen Rose, Marcus Fizer and Roger Mason Jr. to the Minnesota Timberwolves for Kevin Garnett. Realistic? Of course not. Fun? Absolutely. Scottie Pippen was back for a farewell tour (that one at least had happened in real life) and I had some promising young players in Kirk Hinrich, Tyson Chandler, Eddy Curry and Jamal Crawford. Since I decided to have Jay Williams sit out the entire season just as he did in real life due to his motorcycle accident, I brought in veteran point guard and Chicago native Tim Hardaway to shore up the backcourt. The season itself was definitely an exciting one. Glancing back through the story thread, I’m reminded of some close victories that were a lot of fun, long winning streaks and some big performances by KG. I finished with a record of 64-18 and swept my way through the Playoffs, playing every single game with 12 minute quarters. While I didn’t continue my story thread too far into the second season, I did end up playing and simming through it, ultimately capturing a second straight title. I’ve previously mentioned that NBA 2K13 isn’t just one of my favourite NBA 2K games, but one of my all-time favourite basketball games, period. Although I’ve traditionally been more interested in modes like Dynasty and Association, MyCAREER is the mode I’ve spent most of my time with in NBA 2K13 and the main reason I’ve enjoyed the game so much. Yes, even without MyCLOSET in the PC version, it’s been a blast. The MyCAREER game I’m playing is the same one I started when I first got the game and was checking everything out, simply because I got hooked. It kind of worked out well for the experience, as I was getting accustomed to the game as I went along, much like a rookie adapting to the NBA. By the end of the year I’d really gotten the hang of things though, putting up some big numbers here and there while helping the Denver Nuggets to a 73-9 season and their first NBA championship, taking home Rookie of the Year and Finals MVP honours while starting in place of the injured Ty Lawson. My second season has gotten off to an equally interesting start, with Andre Iguodala bolting for the San Antonio Spurs, a hot start that is challenging the NBA record for consecutive wins and even bigger numbers now that I’m better at the game from day one of the season. The amount of Skill Points that I receive for big performances leaves something to be desired, of course, but the fake Tweets complimenting them are oddly satisfying. I haven’t updated my story thread in a while but I’m hoping to spend some more time with MyCAREER in NBA 2K13 before NBA 2K14 comes out, as it’s been a fun and memorable experience so far. I mentioned in a previous Friday Five that NBA Live 06 PC is my favourite basketball video game to date, so it stands to reason that it’s the game where I had my favourite Dynasty experience. In fact, I had so much fun with this one that I didn’t just make one story thread about it, I picked it up again years later to continue the saga. Seeing as how I’m not too far off winning another championship, I’ll probably pick it up again at least one more time to finish things off. Once again, I played every contest in an 82 game regular season and a full length Playoffs, with 12 minute quarters. That always makes things a little more special, in my opinion. The season had so many twists and turns as Ben Gordon missed 22 games with a broken wrist; in fact, no one on the roster managed to play all 82 games. The injuries made things interesting and challenging, while signing players such as Latrell Sprewell and Shawn Kemp (the latter’s ratings adjusted for age) added to the story and the fun. I finished the season 48-34, which certainly made me an underdog heading into the Playoffs. With a healthy team I hit my stride in the postseason, going 16-1 and sweeping the defending champion San Antonio Spurs in the Finals. Things have gotten a little crazier in season two with some eye-popping numbers from Ben Gordon, a 77-5 regular season with a huge winning streak and as I said, another championship looming on the horizon. It’s been my favourite basketball video game experience yet and there’s still a little bit of the story left to tell. There are certainly some other memorable experiences that are worth an honourable mention. Winning a championship for the first time in NBA Live 95 was definitely special. Outside of season modes, Online Team Play in NBA Live 08 on Xbox 360 was a lot of fun. On the arcade side of things, defeating all of the teams in NBA Jam Tournament Edition and unlocking the new players and hidden characters felt like a great achievement at the time. I’ve also had several memorable individual games, which I may talk about in a future Friday Five. In any event, while I’d call the five experiences I’ve profiled in the countdown my favourites, suffice to say I’ve had a lot of fun with basketball games over the years. That’s going to do it for this week. What are some of your favourite experiences in basketball video games? Let me know in the comments below and as always, feel free to take the discussion to the NLSC Forum. Thanks for checking in this week, please join me again next Friday for another Five. 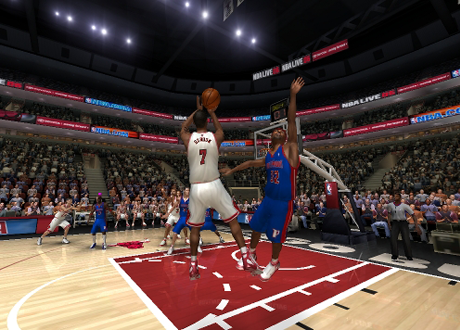 I had to play with Carmelo and the Nuggets as soon as Live 2004 came out. I think I traded Voshon Leonard or someone for Mike Dunleavy Jr. to play the SG because his release was super easy. With Andre miller at the point and Camby at Center. I had Nikoloz Tskitishvili playing like a bonified star off the bench. I played 2.5 seasons but we never won the Championship.